This week we turn to Pope Emeritus Benedict XVI and his Lenten Message for 2012. “Let us be concerned for each other”: responsibility towards our brothers and sisters. “Being concerned for each other”: the gift of reciprocity. “To stir a response in love and good works”: walking together in holiness. This week our Wednesday reflection is from the writings of Cardinal Francis Xavier Nguyen Van Thuan. 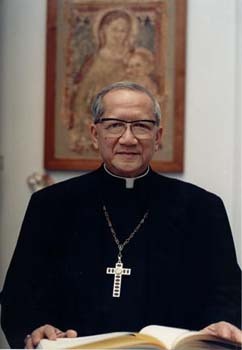 Cardinal Francis Xavier Nguyen Van Thuan (1928-2002) was born in parish of Phu Cam, Huê, Viêtnam. Ordained in 1953, he was consecrated Bishop of Nha Trang in 1967. Jailed by the Communist government from 1975-1988, he spent 9 years in isolation and was never tried or sentenced. Released on 21st November 1988 and obligated to reside in the Archbishop’s House in Hânoi, and forbidden to return to his See, Hô-Chi-Minh-Ville (ex-Saigon). He was declared persona non grata by the government of Viêtnam during a visit to Rome in 1991, where he remained for the rest of his life. The cause for his Beatification was opened in 2007. In his writings there are the ten rules of life. This is the third rule. Prisoners held captive for very long periods, without trial and in oppressive conditions retain bitter memories and sentiments of hate and vengeance. That’s a normal reaction everywhere. I was in prison for 13 years, 9 of which in solitary confinement. Two guards watched me but never spoke to me; just yes and no. But I knew that after all, they were my brothers and I had to be kind to them. I had no gift to offer as a prisoner I had nothing at all, nothing to please them. What to do? One night, a thought came. “You are still very rich. You have the love of Christ in your heart. Love them as Jesus loves you”. The next day I set to work, first, by showing gladness and by smiling. I began to tell stories about my journeys in countries where people live in freedom and enjoy their culture and great technical progress. That stimulated their curiosity and they asked many, many questions. Slowly, very slowly, we became friends. They wanted to learn foreign languages. My guards became my disciples! The atmosphere of the prison changed considerably. The quality of our relationship changed for the better. At that time, in another part of the area, a group of twenty people were learning Latin to be able to read Church documents. Their teachers was a former catechist. One of my guards was in the Latin class and one day he asked me if I could teach him songs in Latin. “There are so many “, I replied, “And they are all so beautiful”. “You sing and I’ll choose ” he retorted. And so I sang Salve Regina, Salve Mater, Lauda Sion, Veni Creator, Ave Maris Stella – You’ll never guess the song he chose. The Veni Creator! I can’t begin to tell you how moving it is to be in a Communist prison and hear your guard, coming down the stairs at 7 AM every morning on his way to the gymnastics yard for physical exercises, singing the Veni Creator. I will speak one language: Charity. While at prison in Vinh-Quang in the mountains of North Vietnam, I was sawing wood one afternoon. I asked my ever-present guard, who had become my friend, if I could ask him for a favor. In another prison in Hanoi, I became friends with my guard and was able to request a piece of metal wire. He was terrified. “I studied in the University of Police that when someone wants electric wire he want is to kill himself!” he cried. I explained the Christians, and most of all priests, do not commit suicide. He hesitated and finally said, “It’s too hard to refuse. Tonight at 7 PM we’ll do it. But we have to finish before 11. I’ll have my companion take the evening off. If he knew, he’d denounce the both of us. That evening, with the tools he brought, we cut and shaped and worked together to make my chain and we finished it before 11 PM! 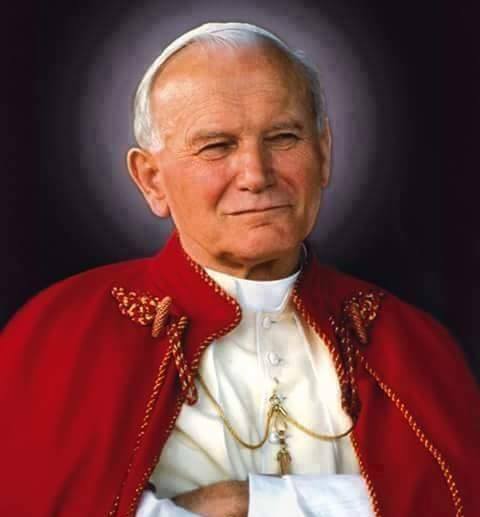 This week our reflection is from Pope St John Paul II and his message for Lent in 1994, which focussed on the family. The Lenten Season is the acceptable time which the Lord gives us that we might take up anew our journey of conversion, grow in faith, hope and love, enter more fully into the Covenant willed by God and experience a season of grace and reconciliation. “The family is at the service of charity, charity is at the service of the family“. In choosing the theme for this year’s Lenten Letter, I wish to invite all Christians to change their lives and their ways of acting, in order to be a leaven which gives rise in the heart of the human family to charity and solidarity, values which are essential to the life of society and the life of each Christian. Above all, I encourage families to grow more aware of their mission in the Church and in the world. In their individual and community prayer they receive the Holy Spirit who comes to make all things new in them and through them, opening the hearts of the faithful to concern for all. Drawing from the source of love, all are enabled to transmit this love by their life and their actions. Prayer makes us one with Christ and thus makes all people brothers and sisters. The family is the first and foremost place in which we come to appreciate and live the fraternal life, the life of charity and of solidarity, in all its many forms. In the family, we learn attentiveness, openness and respect for others, who must always be able to find their proper place. Life in common is also an invitation to a sharing which helps us to rise above our selfishness. In learning to share and to give, we discover the immense joy which comes from the communion of goods. With great tact, parents should strive by word and example to awaken a sense of solidarity in their children. From childhood, everyone is called to mortification and fasting in order to grow in character and self-discipline, overcoming the desire to possess everything for oneself alone. What we learn in the family stays with us throughout life. In today’s particularly troubled times, may families follow the example of Mary, who hastened to visit her cousin Elizabeth, and draw near to their brothers and sisters in need, lifting them up in prayer! Imitating God’s own concern for all, we must be able to say, “I have seen the affliction of my people because their cry has come to me” (1 Sam 9:16); in this way we will not remain deaf to their appeals. The poverty of an ever-increasing number of our brothers and sisters destroys their human dignity and disfigures humanity as a whole: it is a scandal which cries out for the response of solidarity and justice. Today, we must be especially attentive to the sufferings and poverty of families. Many families have in fact crossed the threshold of poverty, and no longer have the bare essentials to feed themselves and their children, to provide their children with a normal physical and psychological growth and the chance to attend school on a regular basis. Some families do not have the means to find decent housing. Unemployment is becoming more widespread and increasing the poverty of entire sectors of the population. Women are left to provide for the needs of their children and for their education, which often leads young people to roam in the streets, to seek refuge in drugs, alcohol abuse or violence. More and more couples and families are experiencing psychological and relational troubles. Social problems contribute at times to the break-up of the family. All too often, unborn children are not accepted. In certain countries very young children are forced to live in inhuman conditions or are shamefully exploited. The aged and handicapped, because they are not financially productive, are left completely on their own and made to feel useless. Some families, because they are from other races, other cultures or other religions, encounter rejection in countries where they have settled. Faced with these grave problems, which have reached global proportions, we may not keep silent or do nothing, because they are destroying the family, which is the basic unit of society and of the Church. We are called to take the situation in hand. Christians and all people of good will have the duty to help families in difficulty, providing them with the spiritual and material help needed to overcome the often tragic situations of which we have spoken. In this Lenten Season, then, I especially encourage sharing with the poorest families, so that they can fulfil their responsibilities, especially with regard to children. No one ought to be rejected simply because he is different, weak or poor. On the contrary, such differences are a source of enrichment for building together. When we give to the poor, we give to Christ, for the poor “have put on the face of our Saviour” and are “God’s favoured ones” (St Gregory of Nyssa, On Love for the Poor). Faith calls for sharing with one’s brothers and sisters. Solidarity in material things is an essential and primary expression of fraternal charity: it provides each one with the means for surviving and for leading a decent life. The earth and its riches are the property of everyone. “The abundance of the whole earth must bear fruit for all” (St Ambrose of Milan, On Naboth, VII, 33). In the difficult times in which we are living, it is certainly not enough to give from one’s surplus; what is needed is to transform ways of acting and patterns of consumption, giving from what one needs and keeping only what is essential, so that all people can live in dignity. This Lent, let us abstain from our often immoderate desire for material goods, so to offer our neighbour what he desperately needs. The fasting of the rich must become the feast of the poor (cf. St. Leo the Great, Homily 20 on Fasting). uld also make every effort to call attention to the pressing duty to help families in need. Once more I appeal to the leaders of nations to discover, on both the national and the international level, the means for putting an end to the spiral of poverty, especially the poverty of families. The Church is confident that government leaders and heads of business, in developing economic policies, will come to appreciate the changes which need to be made, as well as their own obligations in this regard. In this way families will not depend solely on financial assistance, but will be able to meet their basic needs by the labour of their own members. The Christian community joyfully welcomes the initiative of the United Nations to make 1994 an International Year of the Family. Wherever she is able, she will be happy to offer her specific contribution to this celebration. Today let us not harden our hearts! Let us heed the Lord’s voice and the voice of our brothers and sisters! May the acts of charity done throughout this Lent, by families and for families, bring profound joy to all and open our hearts to the Risen Christ, “the first-born among many brethren” (Rom 8:29). To all who respond to the Lord’s call, I willingly impart my Apostolic Blessing. Eddie Gilmore is the CEO of the Irish Chaplaincy in London. This reflection is from his blog which Eddie has kindly allowed Catholic Ireland to include in its series of Wednesday Reflections in Lent. ding anniversary, and with the delicious meal was a very pleasant bottle of Spanish red. Friday was Chinese New Year, which is a big feast in Korea, so we had a glass of wine to go with our special New Year dish of rice cake soup. And then on Saturday I’d been invited by an old friend for a walk and a pub lunch, and we had a beer while we sat out on the terrace in the glorious early Spring sunshine. I finally managed to abstain from alcohol on Day 5 of Lent! I remind myself that the first miracle of Jesus was not the curing of the leper or the giving of sight to a blind person, important as these later miracles were. Rather it was turning water into wine at a wedding feast. And it wasn’t just a few bottles; it was six huge containers, probably far more than would be needed. And it wasn’t just any old wine; it was the very best. Such a gesture speaks to me of a generous God who gives in abundance. The beginning of Lent was marked for me as well by my mother being admitted to a dementia assessment unit. She had been in hospital following a fall and it had become quickly clear that she would be unable to return home. I had made a few trips to Coventry since Christmas to visit her, and was grateful that I’d been with her for what I realised would be the last weekend she would ever spend in the house where she’d lived for nearly fifty years. I also travelled up to be with her for a weekend when she was in the hospital, and it was a precious time of simply sitting together. When I went back to her house in the evening and was looking around at the multitude of family photos on display I felt profoundly thankful for this woman who has loved me so abundantly. My mum came to England in 1957, the year the Irish Chaplaincy was founded. She and my dad were part of that mass wave of emigration from Ireland in the post-war years and they were just the kind of people that the Chaplaincy walked alongside at that time. And today, mum is just the kind of person that our Seniors’ Project reaches out to. I like that the word Lent comes from an old Anglo-Saxon word meaning to lengthen. And that is precisely what happens at this time of year; after the long and hard winter the days finally become longer and lighter. 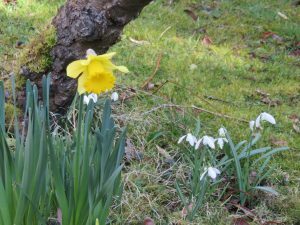 And the Spring flowers are a welcome reminder that new life will surely return once more. And may we this Lent be open to both giving and receiving love in abundance. ‘Remember, man, that you are dust, and to dust you shall return.’ These words of Ash Wednesday remind us not only of the sentence pronounced in Paradise but also of the sinfulness that led to it. We must not think that we are without guilt. We all share the guilt for the suffering in this world. We must let our forty days of Lent be marked by our desire to make reparation for the evil we have done. I believe that all of us must live more spiritually and in penance, and not lose sight of humble prayer and old-fashioned mortification, besides love. For love, prayer and penance are the indispensable corner stones of God’s Kingdom on earth. After the feast-days of the Christmas cycle, the time of fasting and penance begins. A long time has passed since God by His incarnation came down into His creation. The Church has celebrated this joyful event, but war, famine, injustice, terror, blood and tears have spoilt the festive mood. Moreover, the miracle of the Word that was made flesh in order to dwell among us has become unworthy of belief for countless people who are waiting in vain for the radical transformation that the return of God into the world should bring about. 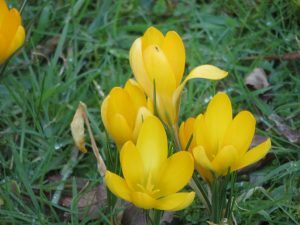 The Prophet Isaiah has described the signs that must accompany this transformation: ‘The wilderness and the dry lands will exult and the wasteland rejoice and blossom and bring forth flowers like the crocus. Then the eyes of the blind shall be opened and the ears of the deaf unsealed, then the lame shall leap like a deer and the tongues of the dumb sing for joy. The peoples will hammer their swords into ploughshares and their spears into pruning knives. Nation will not lift sword against nation, there will be no more training for war. I asked myself what we must do in this situation. I read the answer in the Holy Scriptures: ‘Thus says the Lord: come back to Me with all your heart, with fasting and weeping. Rend your hearts and not your garments and turn again to the Lord your God. Keep a holy fast. Call the people together. Let the people keep watch in prayer. Between the forecourt and the altar let the priests lament and cry: Spare your people, Lord, and do not let your heritage be put to shame.’ Years ago, I proposed to you to return to the tradition of a fast linked with prayer and good works. Now I repeat the appeal. May God strengthen in you the spirit of penance. Most of us live a life that is stained with unfaithfulness. We are all – laity, priests and bishops – a Church of poor sinners. All too often, we deny the Cross that from age to age must redeem the world. That is why in this season of Lent the call to conversion is addressed to each one of us.